Wetaskiwin – After a long winter of heavy snowfall topped off by heavy rains throughout April, lakes surrounding Wetaskiwin were ready to burst their banks. On Sunday, April 25th, a foot of snow fell pushing the water table to the max. Two days later, on the evening of Tuesday the 27th, water crept in and flooded Wetaskiwin. The idea of a flood happening in Wetaskiwin is hard to fathom, considering the lack of any large bodies of water or rivers flowing nearby. Certainly nothing like the carnage witnessed this past summer in southern Alberta. However if you didn’t know it, Wetaskiwin used to have a creek that flowed right through the center of town in the early 1900s. There were footbridges located at various locations throughout town. The creek came in on the west side of town heading to the center then headed northeast out to the Gwynne Valley. By 1948 this was long dried up. The low lying contours of the creek were still there and could if needed, provide a natural pipeline for any pressure release from surrounding lakes, which, till that point in time never happened. During a City Council meeting on Tuesday evening, “Gus Roth, who lived across the street from the curling rink, phoned to say that water was pouring in one side of his house and out the other”. Council adjourned so they could investigate. Mayor Merner, Alderman Mosesan and a few others headed out, and at first thought it was a water main break. Shortly after, they discovered the water was in fact coming from Sandy Lake and an old creek which flowed out of Bear Lake. “At 1:00 am the fire alarm sounded and kept on sounding to alert people of danger. People in the southwest part of town were warned but people in other parts didn’t know why the siren was on. Several hundred citizens worked through the night and the following day building a dam west of the highway, and widening the ditch north of the cemetery so the water could flood what was Weller’s open field.”(now Centennial Park) The water continued to rise and by Wednesday morning several blocks of Wetaskiwin were flooded. Growing pools of water began to appear everywhere. The old dried up creek bed running through town was no match for this amount of water. Heavy equipment loaned by the Eliason brothers, the gas company and the municipality began bulldozing ditches and dams. By Friday rising water on the north side of town created another situation. At McEachern’s Mill the water rose 7 feet. The solution to the problem was dynamite. Two hundred and forty pounds of explosives were used to blast a ditch across the road, so water could fill a culvert under the CPR tracks. The blast broke windows in buildings as far as three and four blocks away and literally shook the town. “On May 1st the sirens screamed another warning which brought fresh crews in to reinforce a newly constructed dam”. On top of everything there was more rain, and lots of it. The dams held up and eventually a cleanup was started which took months to complete. People of the community would never forget. “One woman wanted to take her new washing machine with her when she was evacuated, even though her basement was flooded to the roof.” Citizens rowed boats down main street. 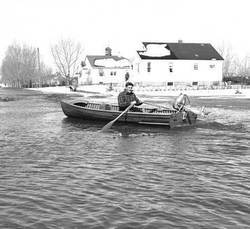 Edna Loader delivered orders by boat for Paten’s Supermarket. “Mayor Merner like the Captain of a sinking ship left council on Tuesday evening and did not go bed till Thursday, then was up again two hours later. Workers needed his permission to tear up streets, and everything else”. The community stuck together and made it through the “Flood of 48”. After all this storm sewers were built and large ditches were dug so this wouldn’t happen again. “Furniture could be replaced, but many valuable pictures, books and keepsakes were destroyed”.